QCOSTARICA – The Syrian woman, who was arrested for entering Costa Rica illegally last November, using a stolen Greek passport, was released earlier this year, in January, and now works with the Muslim Association of Costa Rica. This was confirmed by the press office of the Ministerio Publico (Prosecutor’s office). The prosecutor’s office added that the 31 year-old woman, surnamed Bustati, faces criminal prosecution for using a false document, is barred from leaving the country, must maintain a fixed address and sign in monthly at a judicial office. In the meantime, parallel to her criminal proceeding, the woman is working on legalizing her immigration status in the country, seeking refugee status, alleging she cannot return to Syria because her house was destroyed in a bombing. The immigration service press office confirms the matter (refugee application) is still pending a resolution by the Commission of Restricted Visas and Refuge (Comisión de Visas Restringidas y Refugio). “It has not yet been approved or denied,” said the press office. Bustati travelled from her country to Costa Rica (some 18,000 kilometres) to reach her final destination, Germany. 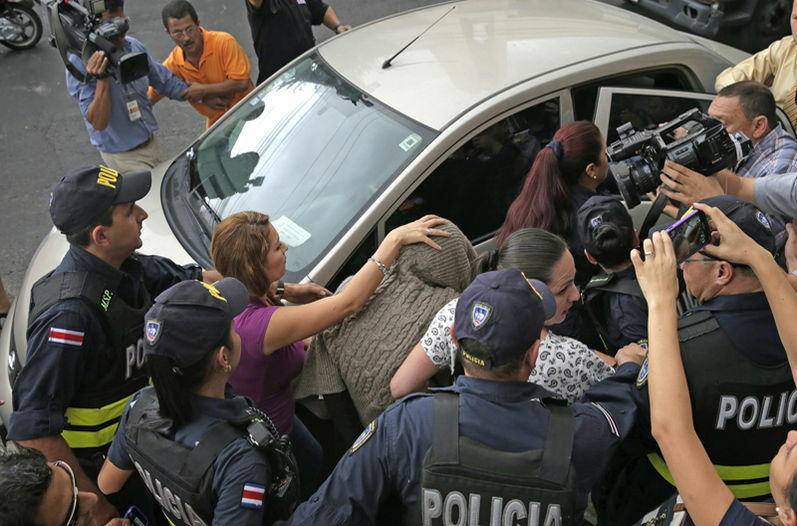 Her arrest followed the arrest in Honduras of other Syrians, using false passports, after having passed through Costa Rica, on their way to the United States, they said. A check of immigration records revealed Bustati’s entry into the country. On November 19, 2015, the day following her entry using a false passport, she was picked up by immigration officials at a downtown San Jose hotel. The simultaneous entry of the Syrians alerted officials to a possible security risk, following the November 13 attack in Paris, France by Syrian jihadists, leaving 130 dead and 368 wounded. The Director of Immigration, Kathya Rodriguez, on January 14, 2016, told legislators of the Legislative Commission on Security and Drug Trafficking, the Syrians had mocked airport controls using Greek passports, a nation part of the European Union, whose countries Costa Rica does not ask for a visa. Rodriguez added that they (the Syrians) were caught in Honduras because that country uses a biometric control system that recognizes physical traits such as fingerprints, facial patterns, iris, etc. Due to the fragility of migration control, authorities in Costa Rica ordered an administrative investigation. According to Carmen Muñoz Quesada, vice-minister of the Interior, the results of the investigation will be available on April 26. Muñoz explained that the investigation is being carried out by two officials, one of the Directorate of Intelligence and Security (DIS) and another from the Ministry of Science, Technology and Telecommunications (Micitt).